I'm sure I'm not alone when I say I sometimes struggle with a concept for a more masculine based card, but how about a masculine based stamp made feminine? I decided to challenge myself and see what I could come up with! There were three items I immediately put on my want list when I browsed the new Holiday catalog for the first time and I featured all three in this card: the Remembering Christmas stamp set, the Sweater Weather Designer Series paper, and the Burlap ribbon. 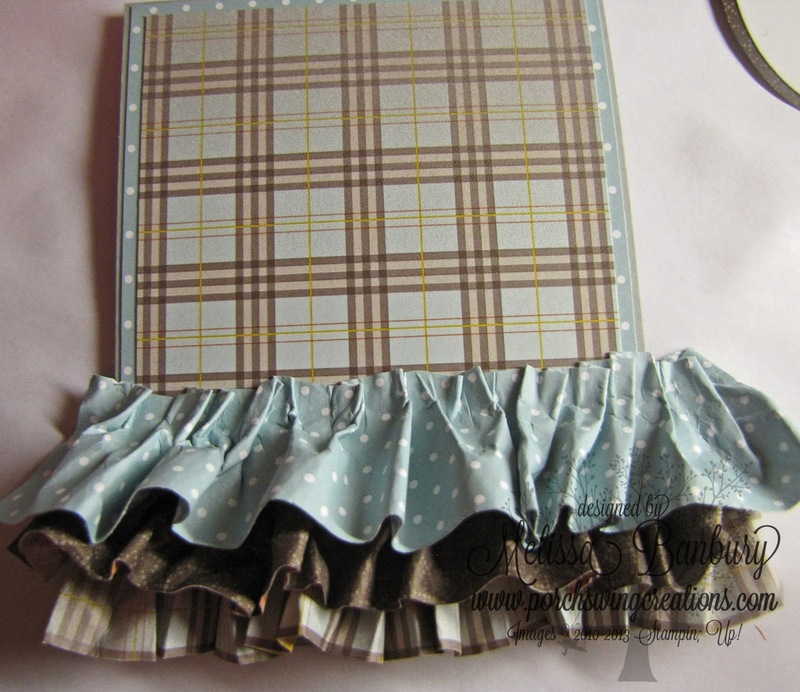 When you look at all three of these items there is no denying they all look quite masculine together, however, add in a little Pool Party polka dot paper and some vintage ruffles and all the sudden it takes on a feminine feel! I've created a step by step photo tutorial below on how to create this card along with paper ruffles - hope you enjoy! Begin by cutting a Smoky Slate cardbase measuring 4 1/4" x 11". 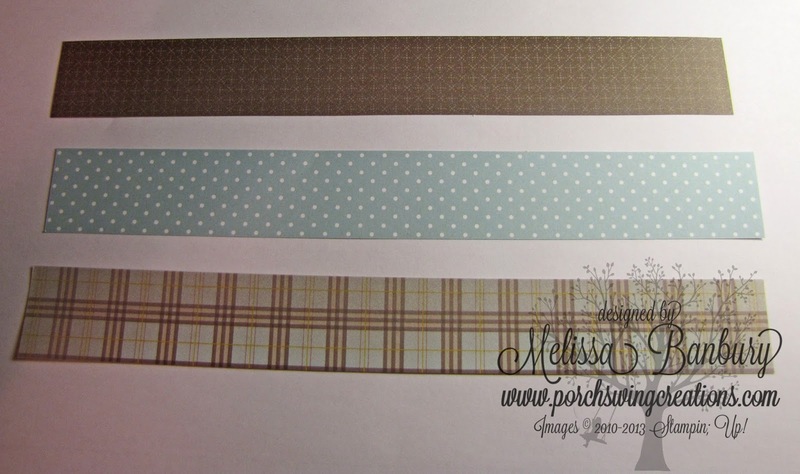 Cut a Pool Party polka dot layer measuring 4 1/8" x 5 1/4", followed by a Sweater Weather DSP (brown plaid) layer measuring 3 7/8" x 5". Glue all layers together using Snail. Cut 3 strips of paper measuring 1 1/2" x 12" - in this case I chose two patterns from the Sweater Weather DSP pack and the Pool Party polka dots again. Flip the strips over and spray a fine mist of water onto each strip using a Stampin' Spritzer. Be careful to not apply too much water or the paper will tear in the next step. Rub the water with your fingertips to be sure all the paper is covered. 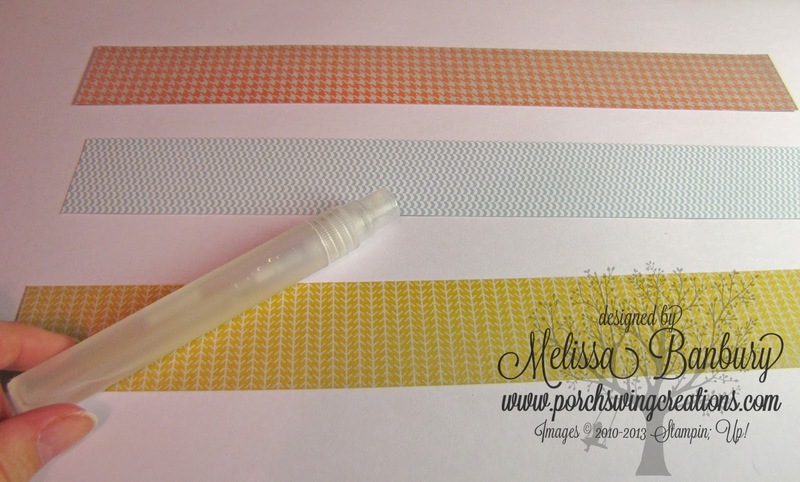 Flip the strips back to the right side and begin pleating the paper together just along the top edge of the strip. 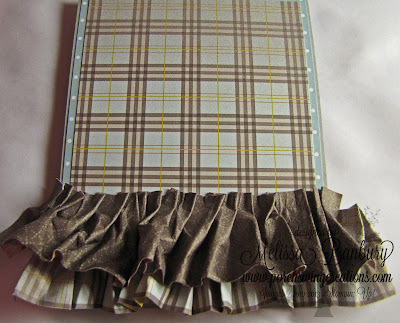 To add more fullness to your pleats use the round end of a bone folder to "fluff" the pleats open. Be careful - the paper is prone to tearing because its wet so don't pull the paper too hard! When all three strips have been pleated, secure the top edges with large clips. Set aside to dry, minimum of 15 minutes or so. When the strips are completely dry, take the clips off and lay onto a flat surface, wrong side up. Apply Sticky Strip to the top edge. Remove the backing. 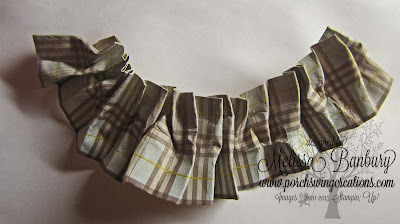 Flip the strip of paper back over to the right side and begin regathering the ruffle. This step takes time so be patient! 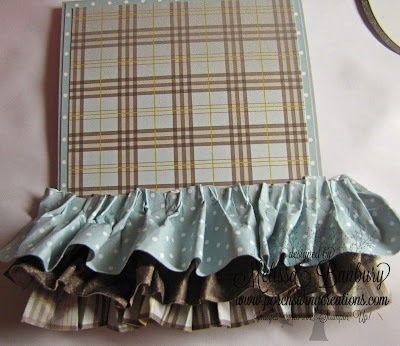 Use a bone folder once again to "fluff" up some of the ruffles. Complete these steps for all three strips. Begin applying your strips to your card base. 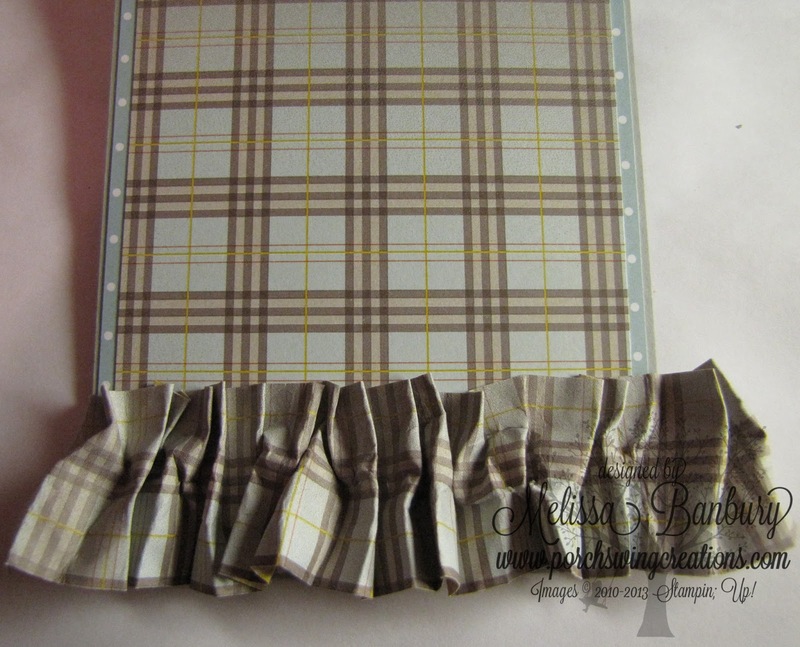 Line up the bottom of the ruffle with the bottom of the card, securing the center of the ruffle first. By doing this it allows you to make adjustments to be sure your ruffle is straight. It should be noted that you should not need to add any more Sticky Strip to the ruffles - they should still be plenty sticky! Leave any overhang on the sides of the card as is for now; we'll tidy that up later. Apply the next ruffle on top of the first. Its completely up to you on how much space you'd like to leave between each. I didn't leave a large space simply because I wanted plenty of room for my image when I placed it on. 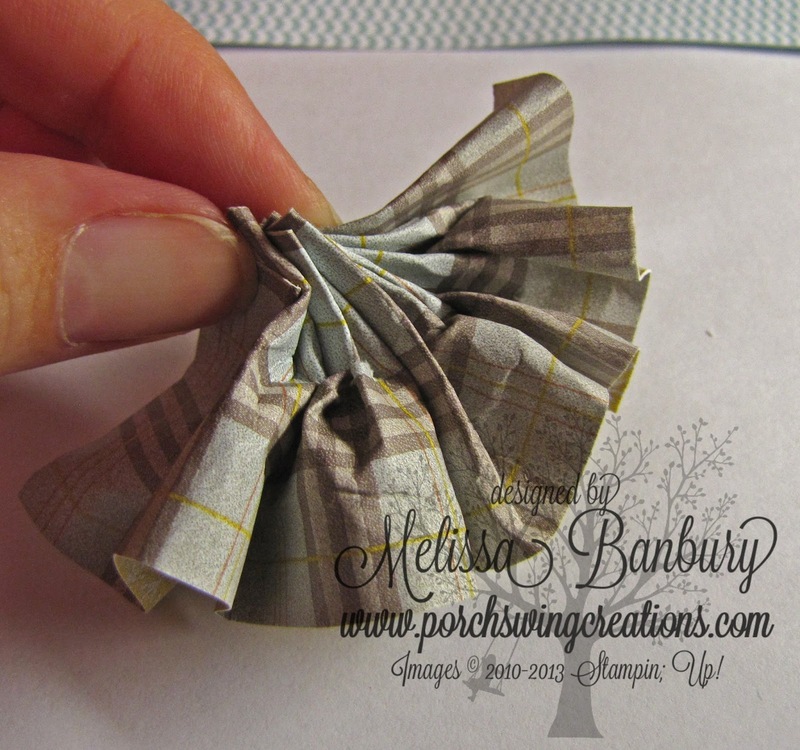 Apply the final ruffle in the same manner as the previous two. At this point, take paper snips and cut the ruffles flush to the edge of the cardbase. Stamp the deer onto Whisper White cardstock using Chocolate Chip ink. 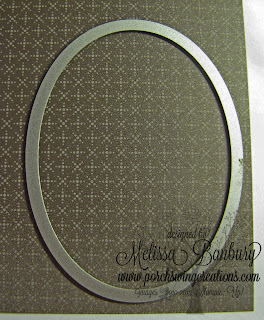 Cut out with the Big Shot using the third to smallest oval from the Oval Framelits collection. 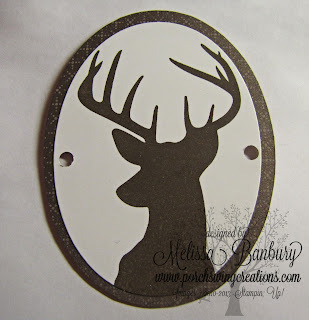 Using the same Oval framelit used to cut out the deer image, trace the out most edge of the oval onto Sweater Weather DSP with a pencil. 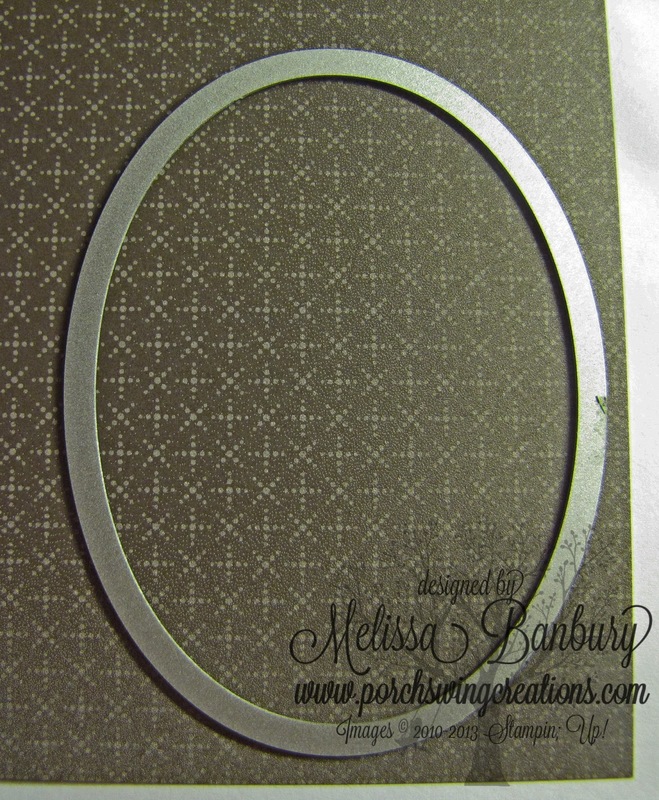 Cut out the oval carefully with paper snips. Center the deer image on this layer with Snail. Punch a hole onto both sides of the oval, centering as best as possible. Thread a length of Burplap ribbon through the holes as pictured. Tie a double bow to one side of the image. 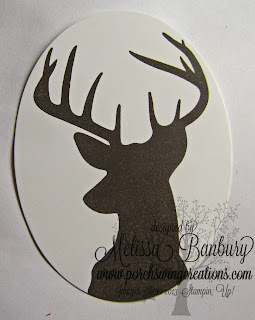 Adhere to the card front using Stampin' Dimensionals. Add a couple of buttons onto the card front as well, securing each with a couple of glue dots. Another look at the finished card. I hope this tutorial gave you a little inspiration! 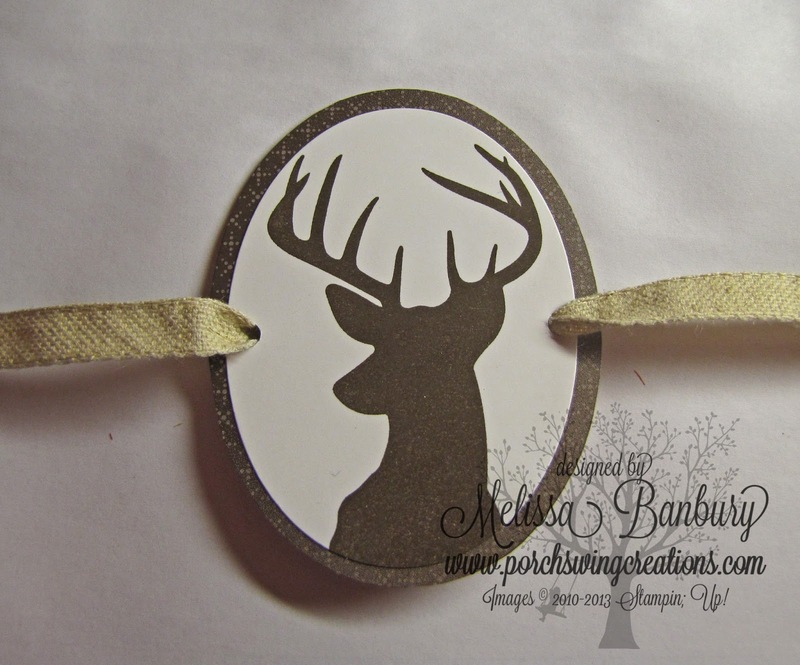 Always remember that a stamp image doesn't have to be used for its intended purpose - masculine can be made feminine and Christmas images, used in the right way, can be used any time of the year! Challenge yourself to see what you can come up with! Thanks Melissa. I've been patiently waiting for this tutorial. You did an amazing job. 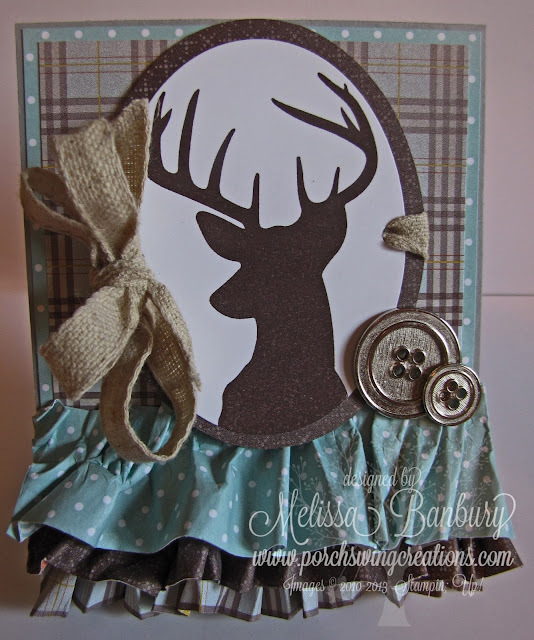 Melissa, your tutorial on this fantastic card is awesome. This stamp hasn't held any appeal for me until now. Thanks for sharing your amazing talents.